A leak obtained exclusively by OurNHS reveals deeply worrying details of one of the largest NHS privatisations yet - the proposed privatisation of cancer care in the Staffordshire area. A leak has revealed deeply worrying details of one of the largest NHS privatisations yet - the proposed privatisation of cancer care in the Staffordshire area. 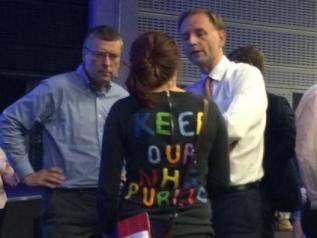 A secret “Memorandum of Information” - published exclusively here by OurNHS openDemocracy - sets out details of what will be in the £700million, ten year contract. The document - which is labelled ‘commercial in confidence’ - was obtained by Kate Godfrey, Labour parliamentary candidate for Stafford. The leaked proposals include handing all responsibility for commissioning cancer services for 800,000 patients to a ‘prime provider’ - which can be a private company - who will then sub-contract services to companies of their choice, after an initial 2-year handover period. The first tranche of patients to be handed over to new companies will be breast, lung, bladder and prostate cancer, with others added later, we learn today. The most worrying thing about the leaked plans is their lack of accountability or redress and their shocking vagueness. The document sets out “The commissioners do not intend to specify in detail how outcomes should be achieved” preferring instead “the use of high level outcomes”. It sets out how the contract will be based on nine outcomes set out by Macmillan such as “I can enjoy life” and “I want to die well”. During the first two years the main responsibility on the company will be to develop a more detailed set of ‘service outcomes’ - the criteria that they will be measured against for the remaining eight years. This, Godfrey says, is a unique arrangement - deciding ‘most of elements of contract design’ such as performance standards and targets, after the contract has been awarded. The company writes its own rules, effectively, and decides what it will - and won't - do. But there are clues. There is an emphasis on patients being expected to “self-manage at home”. There is talk of a “stable and managed change environment where providers of care know what is expected of them…this will require disinvestment for (some)”. And if the ‘prime provider’ company does fail the tests they have created for themselves, there does not appear to be any provision for a break clause for the NHS to get out of the contract. OurNHS understands that - on the basis of what is set out here - it would be legally very difficult if not impossible for the ‘prime provider’ to be sacked for failings which they could blame on their sub-contractors. The shortlisted 'prime provider' bidders are all both controversial and well connected. They include United Health (through its subsidiary Optum), the former employer of new NHS boss Simon Stevens; Virgin Care (who have been warned about service standards by inspectors), CSC Computer Sciences (who were paid £12bn by the UK taxpayer for an IT project that failed to deliver anything that worked) and Interserve Investments (chaired by former Conservative policy chief Lord Blackwell). It seems more likely that the NHS may - or may not - become a sub-contractor to the company that now holds the NHS purse strings, fundamentally inverting the power balance and making NHS hospitals dependent on decisions by private companies for income - and survival. The Memorandum of Information - which Godfrey has been advised is legally enforceable - has been prepared by cancer charity Macmillan, whose involvement in the plan has been heavily criticised - and by the shadowy ‘Strategic Projects Team’. The latter have overseen many of the most controversial (and botched) NHS privatisation plans, including Hinchingbrooke (where the private operator Circle withdrew the day devastating care failings were exposed by CQC inspectors) and older people’s services in the East of England, where over a million pounds was wasted on tendering a huge contract only to discover no private company could provide services better than the NHS could. Even Chris Ham of the Kings Fund - often reluctant to criticise government health ‘reforms’ - admitted to Valerie Vaz MP that this plan “is a risk to take with taxpayers money.’. The Kings Fund has also pointed out that whilst simply handing over the responsibility for spending large amounts of NHS money to a private company is “simple for commissioners to manage”, it also raises “Concern over management of co-morbidities and other boundaries”. What happens to the radiology department who are dealing with both cancer and non-cancer patients? What happens to the cancer patient who is being treated by the NHS for other conditions such as diabetes? What happens to patients who live on the geographical margins of the area? Does the contract even cover all patients in the area? To what extent will existing services be provided? What standards are expected to be met? It seems these are treated as minor details to be worked out - after the £700m contract is awarded.